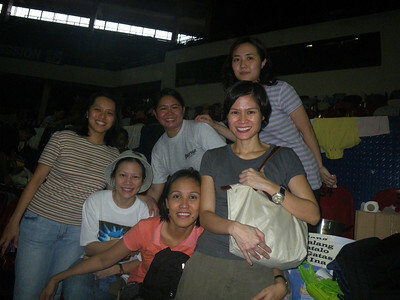 Last October 8, 2009, six of us LATCHERS went to ULTRA for a breastfeeding mission. We had some donated goods with us (soap and old clothes and sanitary napkins) and a whole chest of frozen breastmilk. Pasig was experiencing brownouts then so there was no power that time. Thank goodness the skies were overcast so it wasn't that hot. I am not sure anymore if the building we went to (the one with the bleachers) was Bldg. 1 but anyway, people were sleeping in the main court while some are hanging out at the bleachers and drying their clothes there. I did not have the guts to take pictures of their plight anymore, I feel, they've been documented enough already. Anyway, we gathered as best we could all the moms in one area of the bleachers and grouped them according to baby's age. I took down the names for the preggy moms while others handled those who are exclusively breastfeeding or mixed feeding 0-6 month babies, those with 7-12 month babies, and all the rest of the other moms who wanted to join. We couldm't use the mic because there was no power and had to shout ourselves hoarse in order to be heard. At one time, we were lent a megaphone but we couldn't use it a long time because the people managing the evacuees needed it. Basically, since they reported to be a generally breastfeeding population (about 120 moms in all, 90% of which said they were breastfeeding), we just turned the talk into a myths contest thing. We asked questions on popular breastfeeding myths and got someone to answer. We then elaborated on the answers and corrected wrong notions. And we also gave a prize to the mommy who answered. The moms turned out very participative (the lure of toys for their kids or that they were a little bored din) so although we'd have appreciated a census and a better venue than the bleachers, it still proved a rewarding experience. We also did not need our chest of breastmilk much as most of them were breastfeeding. It was so frozen too that the little we thawed, we had to thaw using a pot of hot water. 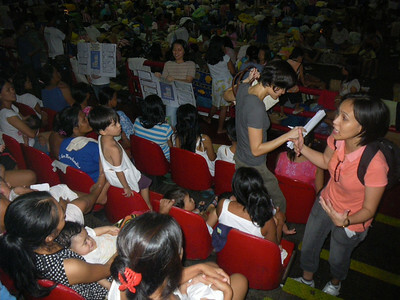 Another group was preparing to distribute goods there and when one of the LATCHers found out they planned to dole out formula milk, we got the doctor from Pasig and DOH representative present to talk them out of it. We answered their questions as best we could but couldn't do any more one-on-one counseling. We also might come back again to hold the same for those in Bldg. 2. Let me just also share a snippet of the minutes sent to us by Dr. Zeka Tatad To of her meeting with UNICEF, WHO, DOH, IYCF, Arugaan and other NGOs that started this all. The goal of collecting breastmilk is to be able to provide temporary relief to mothers/infants where the mother is too ill to breastfeed, or the baby is fully dependent on formula. 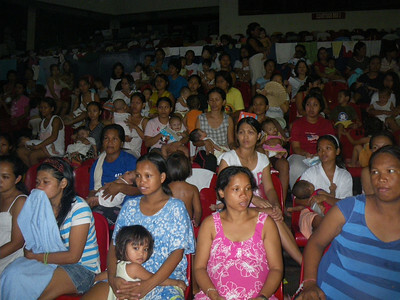 The goal of the program is to get as many mothers as possible to return to exclusive breastfeeding, and to protect those who are already breastfeeding so that they continue to breastfeed exclusively for the first 6 months and then continue to breastfeed with the addition of complementary food. It was shared during the meeting that other countries in Europe and America have come to the realization that the widespread use of formula in a disaster is harmful, and have agreed that formula donations will not be accepted. Someone also shared a study done during the 1940s of babies who were born in concentration camps and breastfed exclusively for the first 6 months and then onwards. 100% of these babies survived beyond 3 years of age despite the dreadful conditions. This survival rate was higher than that of their parents.